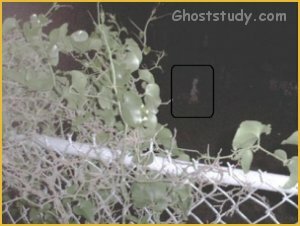 http://www.northern-ghost-investigations.com • View topic - Cemetery child apparition! Post subject: Cemetery child apparition! James writes, "My aunt gave me a digital camera for my birthday and since then my wife and I go to a cemetery to take pictures from the dirt road every so often (mainly because I'm too chicken to go inside in the dark). The cemetery is only about a 1/2 mile from my house and it also has a crematorium. The cemetery was est. in 1874 so it has some old graves. I've gotten 2 pictures of small orbs but nothing like this. To me it looks like the little girl is in a hurry to go somewhere (close-up above, full image below). The only thing is, I went back during the day to take a look and the little girl would have to be only a foot and a half tall. Take a look and tell me what you think." 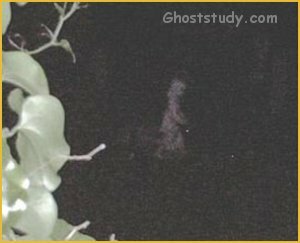 sure does look like a blonde little girl,pre occupied with getting some where in a hurry.dont no if she is a spirit child though?i will be amazed if she is a spirit,as the picture is so clear .maybe to good a picture to be true.im not sure. Could it be one of them statues you see in cemeteries? how come i didnt think of that?very good thought mike.yes it could be a statue. Yeah it does look like she is walking. yep it sure does look like she is walking ,i quite agree with you kat. Post subject: Re: Cemetery child apparition! Good pic! It looks convincing to me. From what I've heard, some ghosts appear like mist, others are more solid - like this one.